Summary: When a pilot crashes and tells of conflict in the outside world, Diana, an Amazonian warrior in training, leaves home to fight a war, discovering her full powers and true destiny. There is a strong chance that when 2017 is looked back upon, the film Wonder Woman may be the most evocative of the era. It isn't necessarily just that it's one of the many successful superhero films to rack up money at the box office. It's also the idea of Wonder Woman as a symbol at the time. She grew from a secondary Justice League character to someone who could carry her own movie and still receive critical acclaim and box office glory. Even if audiences knew who she was, this moment was still groundbreaking for those wanting to see themselves on screen. If nothing else, it broke a long tradition of female superhero movies being bad (see: Supergirl, Tank Girl, Catwoman, or Elektra). This wasn't some kitschy throwback to the Lynda Carter era in the late 70's. This was Wonder Woman for the 21st century. It's easy to see why it was so popular. The scene in which she crosses "No Man's Land" is a thrilling sequence in which she proves her strength amid powerful forces. She may be part of the most masculine superhero franchise of the moment, but she stood out for how she subverted the expectations of the male gaze and in some ways lampooned it with the Chris Pine role. It's a film that feels suited to the ongoing Me Too and Time's Up movement where women are challenging societal norms - especially as they relate to the patriarchy. For them, they are venturing into a "No Man's Land" that could cost them careers. Instead, it has created a powerful movement in which Wonder Woman is among the icons held up as strong individual women. While the film may be arguably flawed, it still symbolized something that's more direct than Guardians of the Galaxy Vol. 2, Thor: Ragnarok, or Spider-Man: Homecoming. The gist of this week's Failed Oscar Campaigns is that it's impossible to capture the entire zeitgeist of Wonder Woman from the past year. There was plenty that was controversial, whether it be star Gal Gadot's faith, or the infamous all-woman screening that was sabotaged. However, the goal will be an attempt to capture elements that present the film in its most prestigious light. 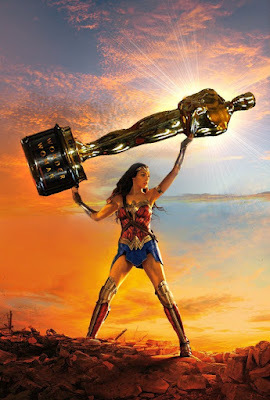 While I do intend to talk briefly as to whether Justice League played a part in Wonder Woman's awards failure, I think that this is a topic that could be its own miniseries. Because of that, I'll try to only cover the hits, including its actual official Oscar campaign from Warner Bros. Still, it's a film that continues to be discussed and was an incredible success, earning $821 million internationally. It wasn't just another superhero movie. It was one symbolizing a potential change. The buzz around Wonder Woman was something that came immediately in spite of some concerns. It was a superhero film from a female director about a girl who fights. The logic was that boys don't like girl things, but alas the enthusiasm outweighed the skepticism. Wonder Woman was the superhero movie of the summer. It received acclaim with many praising director Patty Jenkins for capturing a hero who could be feminine but also powerful. Gadot was hosting Saturday Night Live and serving to knock down negative feedback of misogyny. She was the symbol of girl power, and also left many believing that the D.C. Extended Universe (D.C.E.U) had some redemption. Ironically, it was a film that altered the course because of its light humor, dismantling the planned D.C.E.U. continuity in favor of standalone movies. All they had to get through was the initially more hyped Justice League, which was plagued with production issues and inevitably became a notorious return to form. It's not clear if Wonder Woman stayed in the zeitgeist because of the Jenkins film or the later film (not to mention the less successful Professor Marston and the Wonder Women). However, it helped to suggest that she was a figure to be reckoned with. Studios began to greenlight other female-centric superhero movies, including a proposed Batgirl movie. Even if the film could be criticized, it was having a positive impact for women in Hollywood. Suddenly the notion that those films were only as good as Razzie winners like Catwoman and Elektra was disappearing at a spectacular rate. Even the idea of women directors working on tent pole movies was beginning to shift after Jenkins' success made Wonder Woman among the highest grossing movies of the year, whether directed by a man or woman. There's a lot of outside variables that made Wonder Woman relevant throughout the fall. Many compared Gadot in Justice League to her earlier work in Wonder Woman, often arguing that she was the bright spot of a bad franchise. However, Hollywood was also shifting during this time in which people accused figures like Harvey Weinstein, Louis C.K., and Kevin Spacey of sexual harassment. It lead to the bigger Me Too movement, where women spoke up about their histories and sought to make Hollywood a better place that was less based on the "boy's club" that had ruined careers. Wonder Woman wasn't necessarily about sexual harassment, but it captured a woman fighting unstoppable forces and breaking from expectations. In a year where that was the case, it makes sense why the film resonated. Jenkins in particular would be among Time Magazine's Person of the Year list, again being called groundbreaking. Another factor beyond social media and pop culture constantly talking about the film was Warner Bros. and the actual campaign. They started an actual website (which is no longer available) that was a For Your Consideration page in all categories. The belief that the film's success could get Gadot and Jenkins into the conversation seemed plausible. There hadn't been a woman in the Best Director category in almost 10 years, and superhero films needed to break the taboo of being unworthy of the Best Picture field. It was a hefty task, but it was the exact tactic that the film strove on, giving many faith that it would show up big on Oscar nominations day. After all, what film received half as much attention as Wonder Woman? The one issue was that Wonder Woman's awards season had been slim. One could argue that it was because it was seen more as a summer blockbuster. Even then, that argument doesn't work when looking at other major players like February release Get Out or late summer hit Dunkirk. Even in the realm of being a female Best Director nominee, the momentum for Jenkins' nomination was overthrown by Greta Gerwig's work on Lady Bird. The film received a Screen Actors Guild award for Best Stunt Ensemble, but it had missed out on Golden Globes and other major players. It was a zeitgeist movie without the trajectory of a crossover hit. Get Out seemed to consume conversation in a way that reminded audiences that superhero films still have a ways to go to earn a prestige credibility. Even the biggest film of the genre - The Dark Knight - lead to a change for a more diverse Best Picture category without leading to an actual superhero nomination (Birdman doesn't count). In short, Wonder Woman wound up earning zero Oscar nominations. It's still not clear whether it was the film coming out "too early," or if Justice League zapped Gadot's good will, or if the superhero taboo was still an issue. Still, it was among the films that were highly discussed as being snubbed. Warner Bros. had scored a lot of nominations for Dunkirk, Blade Runner 2049, and Kong: Skull Island. Ironically, the other major awards push for the studio that failed was The LEGO Batman Movie, which also received flack for not being nominated. There's a lot that the Oscars got right, but the debate about whether Wonder Woman deserved to break the metaphorical glass ceiling on superhero cinema will rage on. Even if Wonder Woman lost at The Oscars, it's abundantly obvious that it won the zeitgeist not only for 2017, but possibly for popcorn movies in general. In a summer where franchise films failed, she can at least be part of a success story that marked an overall positive change for cinema. Maybe because of Jenkins and company, the future of superhero cinema can crossover with prestige cinema more easily. Maybe Wonder Woman 2 will be The Godfather Part II of superhero movies (though, to editorialize, that's director Sam Raimi's Spider-Man 2). For now, there's a clear divide between what is perceived as popular and what's great. It's still peculiar that Wonder Woman didn't rack up any technical nominations. With that said, the film is likely to wear its Failed Oscar Campaign badge with some pride. It won the year better than Three Billboards Outside Ebbing Missouri or The Post. That counts for something.